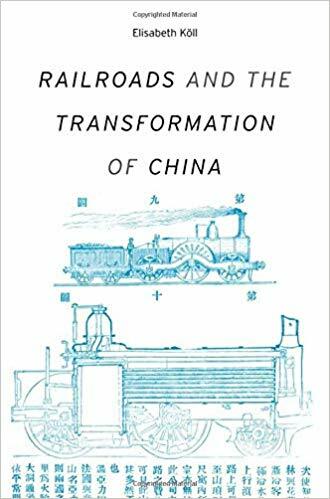 Review of Railroads and the Transformation of China by Elisabeth Köll. Harvard, 2019. China’s soon to be 30,000-kilometer high speed rail network is rightly a point of pride for the country; indeed, the name of its newest line of passenger train, fuxing, speaks to Xi Jinping’s call for national “rejuvenation.” In a new book, Purdue history professor Elisabeth Köll examines the earliest history of China’s railroads. The first tracks were laid during China’s semi-colonial era, with Western countries competing against each other to entrench their standards and languages. Leading Chinese recognized rail’s potential, most notably Sun Yatsen, who called railroads “an issue of life and death for China.” His vision for a national railway that would link Eurasia and Africa was as a forerunner of the Belt and Road Initiative. An academic title, Köll’s focus is on on how China built the institutions that managed the tracks and makes use of a number of previously unused primary sources to highlight railroad operations. The book purposely ignores the railroad system Japan oversaw during its occupation of Manchuria. The railroad’s development was delayed at first by a lack of human and financial capital and then later by the upheavals of war and revolution. Electrification did not take place until 1962, and only later did the railroad make a concerted push beyond the coastal cities. Due to China’s comparatively limited development, rail initially had the largest impact on agriculture, as opposed to accelerating industrialization as it had in the West. Because railroads would not assume liability for the freight it shipped, traders would literally send someone to sit on it to assure delivery. Throughout China’s tumultuous 20th century, the railroad often served as the only regular source of national data. During the Great Leap Forward, Mao’s delusions were reinforced as he traveled in his private rail car by local officials who would literally transplant crops along the tracks to give the illusion of a productive harvest. Meanwhile, railroad accidents spiked 70%. Engaging vignettes abound and the writing is often at its most inspired when Köll describes how the railroad captured the popular imagination as a symbol for modernity. Railroads transformed cities and work cultures, shifting them from seats of government bureaucracy to a more commercial orientation. Mixed cars also upended traditional gender interactions and were a source of literary inspiration. Images of train passengers and travelers helped sell everything from cigarettes to powdered milk. “Participation in rail travel came to represent participation in the bureaucratic, well-ordered, and above all modern urban life that the Chinese Republic sought to create in the years before 1937,” Köll writes. Tourism, albeit expensive, was also accelerated by the railways: in the early twentieth century, a “one-way first-class ticket from Beijing to Shanghai amounted to approximately two-thirds of typical monthly expenses for a middle-class urban family.” The most striking example of “tourism,” was the youth who stormed the platforms during the Cultural Revolution to take advantage of free travel to important sites in CCP history. While serious plans for high-speed rail were first put forward in the 1990s, construction was delayed in part because of a debate over technology. The debt and corruption that accompanied the expansion of China’s high-speed rail would lead to the Ministry of Railways’ abolishment in 2013. But the rails’ transformation of China continues: in 2017, there were more than three billion passenger rail journeys, 200 times the figure in 1915.
Review of Under Red Skies: Three Generations of Life, Loss and Hope in China by Karoline Kan. Hachette, 2019. Like their counterparts elsewhere, China’s millennials are known for their individualism, even if their pursuit of identity is more aspirational than realized. 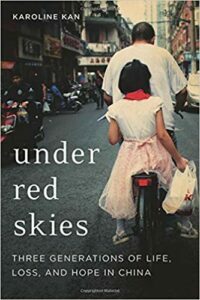 Under Red Skies is a memoir of China’s Reform and Opening Up era through the eyes of one millennial and the distance the pursuit of modernity creates between her and her family. There have been a number of books on the generation that has come of age amid China’s breakneck growth, but most have been written from the vantage point of foreigners, a point of implied frustration for Karoline Kan, the author. “I respect many of these,” she allows, “because they inspired me to write my own.” Born in a rural village outside of Tianjin in 1989, Kan is lucky to be alive at all. Her inspiringly independent mother, who had already had a son, evaded enforcement of the one-child policy to bring the daughter she longed for into the world. By writing this book as a memoir instead of a generational survey, Kan loses the opportunity to fully deploy the journalistic skills she defied her family to pursue. Kan repeatedly connects her early life and family background to the broader forces shaping China. Her family joins the millions of rural migrants in search of greater economic opportunity; her grandfather embraces and continues to secretly follow the banned Falun Gong spiritual movement; and a “shadow of death” is cast over her town from fear of SARS, about which the government suppressed information. In tying herself to these broader events in a way intended to provide context, Kan’s individuality is at times effaced from the narrative. It is effective when she remains focused on her grandmother and mother’s personal experiences: too little remains told about the hardships of their time, including the Great Famine of 1959-1961, and particularly from the vantage point of China’s women. For many westerners, like this millennial reviewer, China’s universities are their first exposure to the country. In these chapters on Kan’s university years, the memoir is an engaging counterpoint to one’s own memories. Initially directed to pursue a major in finance, as graduation approaches Kan finds herself unwilling to give up her dream of writing. Soon she is working for That’s Beijing and initiated into the city’s glitzier haunts, alternating between insecure disdain for her rural roots and the pretentious milieu she now covers. She shocks her family by falling for a white guy. Very little of what remains of the memoir involves her work writing for outlets including the New York Times. 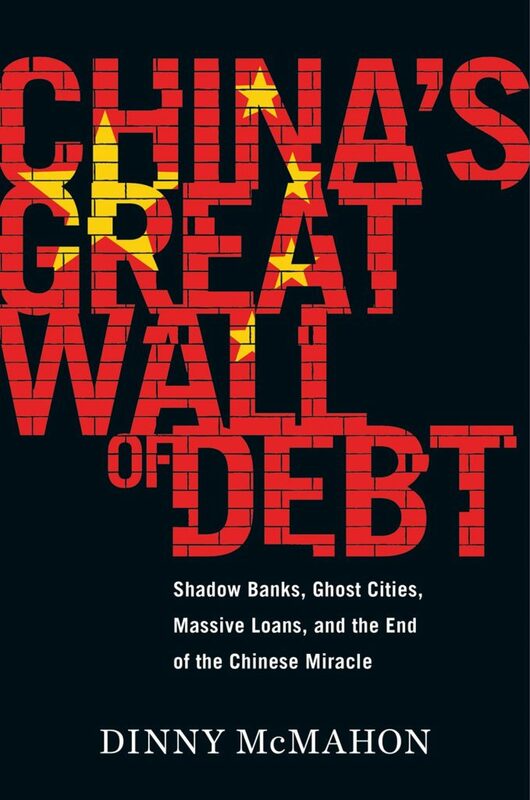 What China’s millennial generation will yet do as opposed to what they have already experienced is a question this memoir prompts but does not answer. How will their global exposure reshape their expectations of themselves, their country, and what it means to be Chinese? As they become parents, will they perpetuate the culture of intensive pressure they were subject to or will they grant their children freer rein? As some begin to assume meaningful power and influence, will they lead their country with confidence in the potential of its people instead of authoritarian fear? This reviewer’s own experience among some of China’s most privileged millennials is a cause for discouragement. Like millennials elsewhere, many readily see their success as the earned result of individual merit, not also the consequence of various advantages and dumb luck. Even as they demand greater freedom from the state for their own lives, too many repeat the line that most of China’s people are not ready for democracy. The cynicism of the West’s millennials, who grew up amid financial and political crisis, is understandable. The cynicism of China’s millennials, who came of age during unprecedented progress, is, in some ways, more troubling. “It is easier to blame China than to understand it; it is easier to judge Chinese people than to get to know them,” Kan asserts in the introduction. Once, criticizing her uncle’s unwillingness to speak out, “I immediately regretted how cruel I sounded. Who was I to tell my uncle what he should and shouldn’t believe in? He was an old man and had never been as privileged as I was lucky enough to be. My generation had abandoned him. He had made a way for us, but we criticized him and everything his generation had built.” With great honesty, Kan shows how much misunderstanding of their country remains, not only among foreigners, but Chinese themselves. 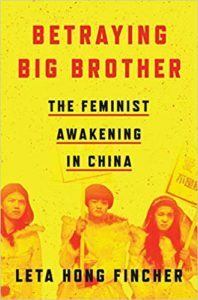 Review of Betraying Big Brother: The Feminist Awakening in China by Leta Hong Fincher. Verso, 2018. The MeToo movement has arguably had greater impact in China than in any other nation outside of the United States. It is all the more surprising given the tight controls that China places on online discourse and the punishing pressure it can impose on those who stir up social unrest. Despite these pressures, in a movement largely concentrated on university campuses, several professors at prominent universities have resigned due to misconduct. China’s MeToo movement is just one of the most recent manifestations of a broader, years-long surge in activism for gender equality in the country. In the years prior to MeToo, China’s women had already begun to more determinedly criticize discrimination at work, inadequate protections against sexual harassment and assault, and even inequalities in the provision of public toilets. These are but the concrete demands of a broader push against a patriarchal society that mixes Confucian tradition and Communist dogma. Leading the charge in this movement are five activists who skyrocketed in international renown when they were all arrested in 2015. In Betraying Big Brother, author Leta Hong Fincher uses their story to frame China’s feminist awakening. 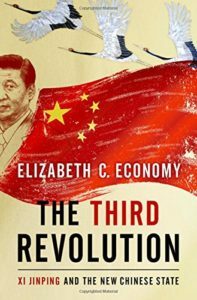 Review of The Third Revolution: Xi Jinping and the New Chinese State by Elizabeth Economy. Oxford, 2018. If the role of journalists is to write the first draft of history, books like Elizabeth Economy’s The Third Revolution: Xi Jinping and the New Chinese State are the essential next draft. In just 250 pages, the Council on Foreign Relation’s China expert guides readers through Xi Jinping’s sweeping reshaping of Chinese politics, society, and foreign relations. Economy focuses on five main themes: Xi’s consolidation of power; the closing off of avenues for dissent, especially online; the government’s uneven economic management and its push for innovation; the country’s battle against pollution; and the country’s growing overseas assertiveness. In each context, Economy illustrates how the pursuit of control is superficially succeeding while undermining the country’s longer-term ambitions. For example, China seeks world-class universities but places more emphasis on political education than quality teaching and actively inhibits the engagement with the rest of the world on which academic progress depends. 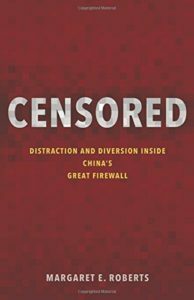 Review of Censored: Distraction and Diversion Inside China’s Great Firewall by Margaret Roberts. 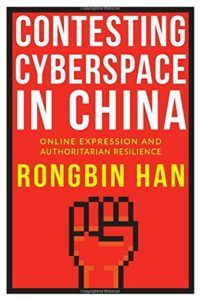 Princeton, 2018, and Contesting Cyberspace in China: Online Expression and Authoritarian Resilience by Rongbin Han. Columbia, 2018. The internet was supposed to have delivered China into freedom by now. But that optimistic consensus has been proven wrong so far. In their books, academics Rongbin Han and Margaret Roberts, attempt to explain why. Han, an assistant professor at the University of Georgia, was a student at Peking University when the internet’s impact first began to be felt on campus and in broader society. But the vibrant discussions the internet initially spurred would prove too much for the ruling Communist Party, which, over time, has become more sophisticated in reasserting information control. 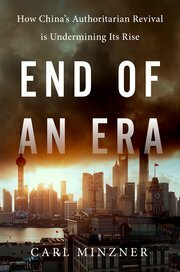 Review of End of an Era: How China’s Authoritarian Revival is Undermining its Rise by Carl Minzner. Oxford, 2018.
Review of The China Questions: Critical Insights into a Rising Power, edited by Jennifer Rudolph and Michael Szonyi. Harvard, 2018. 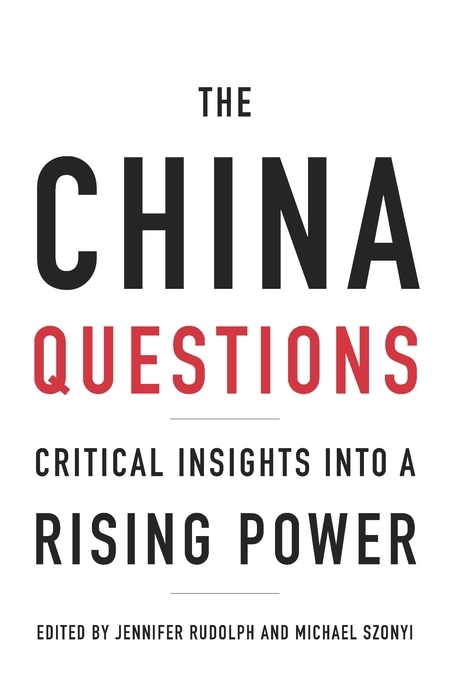 The China Questions is a collection of thirty-six essays, all written by experts affiliated with Harvard’s Fairbanks Center for Chinese Studies in honor of the institution’s sixtieth anniversary. As a project, it is an impressive demonstration of expertise on China commanded by a single institution and a strong challenge to other institutions to continue investing in their own study of China. As a book, both the questions asked and answers offered fall short of its potential. Review of Asia’s Reckoning: China, Japan, and the Future of US Power in the Pacific Century by Richard McGregor. Viking, 2017. “What once seemed impossible and then merely unlikely is no longer unimaginable: that China and Japan could, within coming decades, go to war.” That is the frank assessment with which Richard McGregor opens his new book, “Asia’s Reckoning,” a workmanline telling of the complicated dance between the United States, Japan, and China from the end of World War II through the early days of the Trump administration. Bringing Japan back into the conversation about the United States and China, McGregor warns, is vitally important. “If China is the key to Asia, then Japan is the key to China, and the United States the key to Japan.” To neglect Japan, he writes, is to ignore the ways in which the American hysteria prompted by Japan’s post-war resurgence served as a “a practical and psychological dress rehearsal” for the rivalry to come with China. Review of China as a Polar Great Power by Anne-Marie Brady. Cambridge, 2017. Climate change is normally seen as a global threat, yet melting ice in the Arctic and Antarctic regions for better or worse opens new passageways for shipping and access to tremendous natural resources. It is not just those who border these regions that are taking notice. China has announced to the world that it too will be a polar power. As the closest thing there is to a blank slate in geopolitics, China’s polar activities are also closely examined for what they might reveal about the future of global governance. Anne-Marie Brady, professor at New Zealand’s University of Canterbury, has a new book on China’s growing involvement in the poles, in which she guides readers through the principles of polar governance, the region’s strategic attractions, how China is positioning itself to take advantage, and what it means for the rest of the world.